Went to get my flu shot the other day at my local Rexall pharmacy. While waiting I decided to browse and I came across the product I photographed up above. "Edge LTE Ion Bracelets feature Ion Technology. 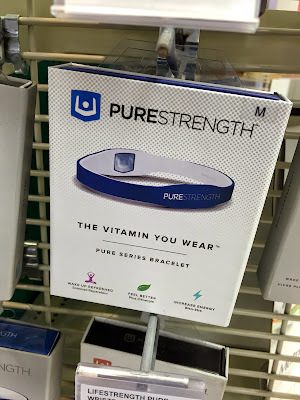 They are made from a comfortable, surgical grade silicone that has been infused with seven natural minerals that work together to produce essential negative ions." Translation? They are made from pseudo-scientific sounding bafflegab and they have zero actual evidence to suggest they do anything other than drain your wallet of money and simultaneously tell anyone who recognizes what you're wearing on your arm that you are overly trusting of front-of-package promises. How is it legal in Canada to sell a bracelet full of nothing with a label that explicitly states it's a vitamin? Shouldn't the use of the word, "vitamin", be restricted to, I don't know, vitamins? Is there not an arm of Health Canada that would be able to shut down a product that falsely labels itself a vitamin? Why is Rexall comfortable selling this (and sooooo much other) nonsense? While I appreciate pharmacies are businesses, shouldn't there be at least the smallest modicum of ethics whereby total frickin' BS isn't allowed to be sold or marketed in a store that explicitly targets health? Or is it all just caveat emptor and the dollars are all that matter? Do You Know How To Feed Your Children?